It has MP but not co-op Apocalypse 31. Panzer Elite Special Edition and then patch to 1.2. That is the basis for PP2-x. The Panzer Pack 2 1.2 beta, has been released over at PEDG. http://pedg.yuku.com/topic/2315/PP2x-Download-Section Requirements: Runs on XP, Vista and Win 7 systems. You must have PE updated/patched to version 1.2 before installing PP2-x. DirectX version 9.0c must be installed for the game to run with PP2-x mod. welcome back Zip and what a great tune... Thank you for the link. 3.011 update, game will not start! All good now thank you Ssnake... I did a uninstall of the codemeter software and then installed the new version of codemeter from their website. After a reboot all SB worked as normal Thank you for your assistance. 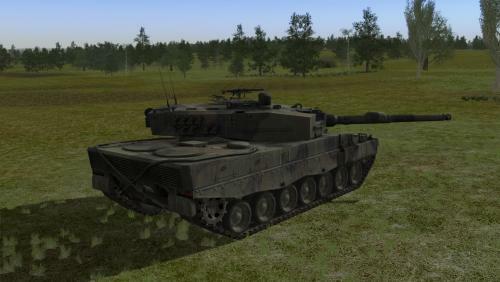 Here are the new Leopard 2A2 skins created by Snorri. These textures are 4096*4096 four times the size of originals. Included in this pack is a Summer, Autumn and Winter skin including bump maps and speculars. Please extract to your \Documents\eSim Games\Steel Beasts\mods folder. Posted on the behalf of Snorri. A few more for this beautiful skin. I did twice but going to recheck I do not see it in there. Tried the R key, no luck but thank you for the reply.